How Deep is Loch Lomond? The depth of Loch Lomond is just one of these Scottish questions people ask. It’s the third-deepest loch in Scotland, after Loch Morar and Loch Ness. Loch Lomond is 623ft / 190m deep. And if you want to discover a lot of other fascinating and downright wacky facts about this loch, then take a look at our big big page Loch Lomond information. Another question sometimes asked is: how deep is Loch Ness? Naturally, people may be thinking about the Loch Ness Monster legend. Officially, the depth is usually given as 754ft (230m) but in 2016 a tour boat skipper using sonar said he recorded 889ft (271m) and claimed it could be a lair for - ho-hum - you can see where this is going. Obviously, a continually reinforced high profile Nessie myth means continuing popularity for Loch Ness cruising. Seems fair enough. Anyway, settling the question about Loch Lomond' depth was first addressed by the Hydrographic Department of the Admiralty in Britain, who did the first surveys in the 1860s. The splendidly named Captain H.C. Otter used a lead-weighted line and a rowing boat for his soundings. The Royal Society of Edinburgh was an enthusiastic supporter of efforts to find out more about the depth contours of many of Scotland’s lochs. Loch Lomond from Duncryne Hill. (Pictured here) This Loch Lomond panorama, looking up the loch from its south end, is a September pic., as you can see by the autumnal rowan berries. The Highland Boundary Fault runs through the islands in the middle distance. The loch is confined to a deep, narrow trench in the far distance. Closer at hand, you can see how it spreads out in the gentler terrain of the Lowland edge. Anyway, the experienced oceanographer Sir John Murray took up the cause and went on to create the ground-breaking Bathymetrical Survey of the Fresh-Water Lochs of Scotland, 1897-1909 – a work that still has value today. In it, we learn that 623ft / 190m is answer to the question how deep is Loch Lomond. This survey is also, presumably, the original source of the oft-quoted other facts about Scottish lochs: such as the water volume of Loch Lomond is 92,805 million cubic ft (second largest in Scotland after Loch Ness); the surface area of Loch Lomond is 27.45 sq miles (largest in Scotland with Loch Ness second) and so on. However, there has been an update on our knowledge of the depth of Loch Lomond. Survey work by the British Geological Society in early 2009 found that the north of the loch is a deep trench with very steep sides, the result of glaciation. Loch Lomond - south end at Balloch. What? Loch Lomond has a monster too? As well as sounding out the depth of Loch Lomond, the original Bathymetrical Survey also looked into another phenomenon seen in Loch Lomond as well as other lochs (lakes) right across the globe. There is an ancient saying about Loch Lomond as having ‘a wave without a wind, a fish without a fin, and a floating island’. The first part of the old saying may refer to a ‘seiche’ – a scientific term from a Swiss French dialect word. It now means a standing wave in an enclosed body of water. (Think of it as a ‘slosh’ – that’s the word that’s used for this phenomenon on the North American Great Lakes.) The key here is that the water body should be enclosed and that the wave is observed irrespective of the weather conditions. As for the other two parts of the rhyme, personally, I like to think that the fish without fin is the Loch Lomond monster – that’s the one that never quite caught on in the way that our chum up on Loch Ness did. Finally, as for the floating island, if it isn’t a monster hump (and, no, I’m not being serious there at all), then it might be the mats of vegetation that can break off the banks after waves or storms. 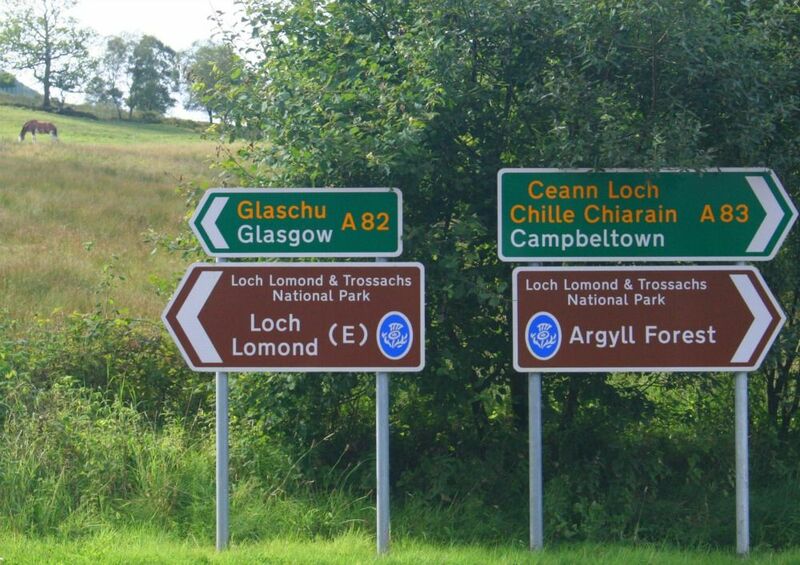 Loch Lomond signposts, within the national park. Note appearance of Gaelic. (Pictured here) Signposts by Loch Lomond, at Tarbet. Loch Lomond has been loved to bits, not just because of that well-known song ‘The Banks of Loch Lomond’ (words below) but because of the fact it lies within easy reach of the Clydeside conurbation, the geographer’s phrase for Glasgow and round about. The area is within the Loch Lomond and Trossachs National Park. Naturally, in an area so beloved of tourists, the ‘infrastructure’ is well developed. There is a good choice of Loch Lomond cruises. Where exactly is Loch Lomond? The answer to this question – discussed below – explains a lot about how the area gained its status as an icon of Scottish scenery. The question is probably asked by folk in other parts of the world who hear that famous song ‘The Banks of Loch Lomond’. Anyway, what’s the appeal of the song ‘Loch Lomond’? Here are a few notes ( and the words below) – and then we’ll move on looking at the strategic position of the loch. What are the origins of the Loch Lomond song? As for the song, some authorities suggest the tune is a variant of the old Scottish ballad ‘The Bonnie Hoose o’ Airlie’, others want to link it to the equally venerable ‘The Lowlands of Holland’ – yes, you got to know your Scottish ballads here! However, most experts agree that the words are quite a bit younger than the tune. The song was first published in ‘Vocal Melodies of Scotland’ (1841). No individual composer is credited. Maybe the prisoner was captured after the Battle of Culloden and shipped across the Border; maybe he was taken while the Jacobite army retreated northwards in the previous winter. Or maybe the whole thing is fictional. But, if it was written around the Battle of Culloden in 1746, then the words with variations must have been around for almost a century before being published. Ben Lomond beyond Loch Lomond. (Pictured here) Loch Lomond spreads out of the Highlands and on to the Lowland edge, Here's the sun that ‘shines bright on Loch Lomond‘ and where the lovers parted on ‘the steep, steep side o’ Ben Lomond‘ – and that's Ben Lomond as seen from across the loch, from its south-western end near Balloch. Again, like Auld Lang Syne, a lot of Scots (at least) can sing their way through the first verse or so, and then things start to get sticky. By verse two (see below), things are beginning to fall apart, while by verse three we are mired in Scottish sentimentality. Truth to tell, it isn’t great poetry. The high road and low road allusions are usually explained as the ‘high road’ as in the highway, a physical route, leading home to Scotland, as opposed to the ‘low road’, meaning death, where the spirit of the soldier returns immediately to his homeland. Tho’ the waefu’ may cease frae their greetin’. So, the subject matter of the song is decidedly gloomy – though that doesn’t stop it being played at weddings and rock concert and other upbeat occasions. Why is Loch Lomond so popular? Loch Lomond lies partly in the Lowlands and partly in the Highlands of Scotland. And, back in the days when Scottish tourism first began, before the end of the 18th century, both Loch Lomond and the Trossachs were areas that were comparatively easy to reach from Scotland’s main cities, especially Glasgow and Edinburgh. Where is Loch Lomond? Quite near Glasgow. (Pictured, actually, sketched, here) Where is Loch Lomond? - splattered right across the Highland Boundary Fault, very near Glasgow. Lucid, eh? Got that? Basically, the Romantics, then everyone else, escaped the city and soon found themselves across the Highland Boundary Fault. There it all got a lot nicer, quite suddenly. Not just on Loch Lomond and in The Trossachs, but also on the Clyde sea-lochs, minutes away to the west. The sudden transition from Lowland Scotland – for example, on the journey north from Dumbarton on the Clyde – to the vista of Highland Scotland, revealed from the south end of Loch Lomond, first excited travellers more than 200 years ago. At that time, the taste of these early visitors was being influenced by the Romantic Movement in the arts and literature. This involved a new and positive way of perceiving wild and untamed places – as a rebellion against the ‘tamed’ landscapes and the order and symmetry of the Neo-Classical Age that went before. Spring on the loch. Ben Lomond from Luss - it's right at the end of April - but the trees stool look a bit bare! 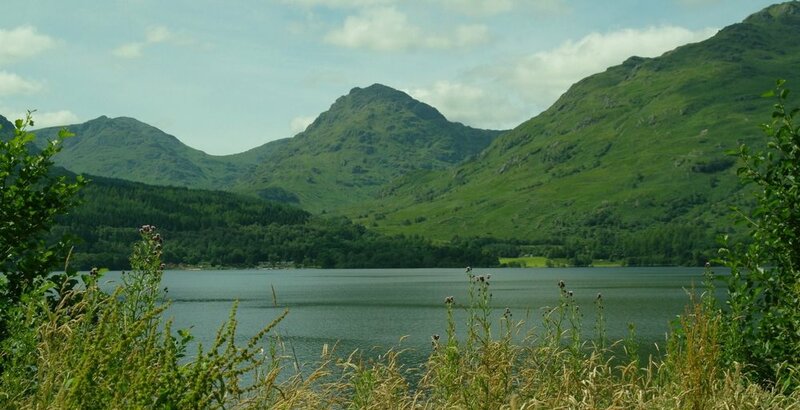 (Pictured here) The ‘bonnie banks of Loch Lomond’ are undoubtedly bonnie. Looking across to Ben Lomond from the shores by the village of Luss. In Loch Lomond and the Trossachs – touched on in the Scotland tourism page – the Romantics found scenery exactly to their new tastes – and they found this wild and beautiful place without travelling too far from ‘city comforts’! So part of the answer to the question ‘where is Loch Lomond’ in a historical context is that it was just far enough away from centres of population a couple of centuries back to give a taste of excitement and daring for adventurous travellers. Famous visitors back then included William and Dorothy Wordsworth who first came this way in 1803. They certainly gave the impression that they were undertaking what amounted to a fearful and unconventional expedition. Now the loch is within minutes of Glasgow Airport, or an easy journey by road or rail – seemingly closer than when it was first discovered and enjoyed by those early Romantics. Today, in fact, more than half the Scottish population live within an hour’s drive. In addition, for more than two centuries, Loch Lomond (and the Trossachs to the east) have been balancing the needs of visitors with the need to retain the essential spirit of wild landscape. It’s a place that, in short, is loved to bits. That is why since 2002 the area that visitors still enjoy is now in the Loch Lomond and Trossachs National Park. If you want a great experience of the area then we recommend you cruise on Loch Lomond. How come Loch Lomond is so deep? Anyway, the Ice Age Glacier Company (no job too large, all materials disposed of) were given lots of time to get the job done. Actually, it all ran a bit late and they were still working on the Loch Lomond landscaping project about 10,000 years ago (though they’d been at it, off and on, for millions of years before that). They came up with some pretty good landscape designs. As you can guess from the name, their main digging tool was ice. Tons and tons of it. Their main depot was up on Rannoch Moor where there was a huge ice sheet. But they moved the stuff south, towards the Highland Boundary Fault, deepening a trench in Glen Falloch. Ooh, a bonus - hanging valleys! They’d worked in the area before of course, but mostly doing east-west work. You can see that today after you come down the steep hill to Inversnaid. You’ve exited from a hanging valley (in which Loch Arklet sits). Look across the loch and, just opposite, at Inveruglas, there’s another one, only not so steep. The picture here gives you a flavour. The valley running up behind Inveruglas on the opposite bank of Loch Lomond matches the one from where this pic was taken. But Loch Lomond lies between. It’s a matching pair of hanging valleys on either side of the loch. The picture here was taken from the foot of one - at Inversnaid - looking across the loch to the other. You can see it climbing away from the shoreline right in the centre of the frame. It isn't as steep as the Inversnaid side though. OK, two matching valleys: opposite sides of the loch. From this you may think that there is some connection. Well, there used to be. Before Loch Lomond was gouged out, a great river once flowed east from the area west of Inveruglas, around Loch Sloy, across the glen in which Loch Arklet sits, then down by Loch Katrine and on south-east into the Lowlands. But this changed when Ice Age Glaciers got the new contract. So they cut a trench south, right across the east-west old river, and much deeper. After it was filled, we called it Loch Lomond. The old landscapes were changed completely. But Ice Age Glaciers hadn’t finished yet. They did the same trick further south on the loch. On the west side, both Glen Douglas and Glen Luss were part of another river system flowing eastwards towards today's River Endrick and on towards Strathblane and, eventually, the River Forth. But the cutting of the Loch Lomond trench changed things. Now the little Luss Water enters the loch by the attractive village of the same name. Even glaciers have to start somewhere. Like it’s said above, the one that created our loch was just one of many that trundled out from a great ice sheet in the vicinity of today's Rannoch Moor. Anyway, the contract stipulated that the Loch Lomond surroundings had to be scenic. Ice Age Glaciers set out to create a loch with bonnie banks worthy of a well-known song. In fact, hard rocks made the job pretty tough and hence the Loch Lomond trench pretty narrow. So, grinding slowly southwards, it must have been a relief when the squad got over the Highland Boundary Fault at Balmaha where the ice could spread out and shift a lot of much softer rock. That’s why Loch Lomond is so much wider at its south end. It’s not in the Highlands. Here, around Balloch or Gartocharn, it’s a Lowland loch. Where will we put all this rock? All around Balloch? In any landscaping project you’ve got to dispose of stuff. Ice Age Glaciers had a great idea – they decided to dump all the rocks and gravels, collected in the north, at the south end of Loch Lomond. So Loch Lomond was effectively dammed by the glacial spoil – and it is only 27 ft (8m) above sea level. All this means is that, on a geological time-scale, the 'Bonnie, bonnie banks' were created just the other day – as the last job undertaken by Scotland’s Ice Age Glaciers Ltd.
That company isn’t around anymore. It just got too hot for them. Scottish Music in the great folk tradition. Scottish music includes both Gaelic and Lowland Scots heritage. Folk music is popular in Scotland today, if you know where to go to hear it.